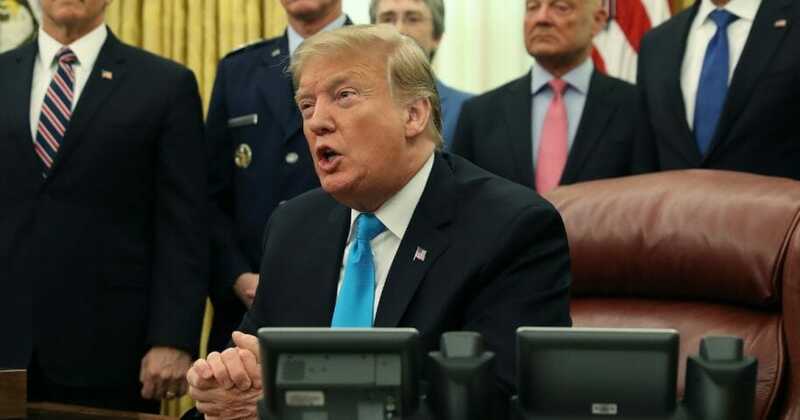 President Donald Trump lashed out at Senate Democrats for blocking a Senate vote on a bill that would require medical care be provided for babies who undergo the trauma of abortion and live. “Senate Democrats just voted against legislation to prevent the killing of newborn infant children. The Democrat position on abortion is now so extreme that they don’t mind executing babies AFTER birth,” Trump tweeted. The Senate on Monday considered the Born Alive Abortion Survivors Protection Act of 2019, which would require babies who are born alive despite an abortion procedure to be cared for. Republican Sen. Ben Sasse of Nebraska sponsored the bill. “I want to ask each and every one of my colleagues whether or not we’re okay with infanticide,” Sasse said Monday. “It is too blunt for many people in this body, but frankly, that is what we’re talking about here today. . . . Are we a country that protects babies that are alive, born outside the womb after having survived a botched abortion?” he said. The bill needed 60 votes to end the Senate filibuster on it and bring the legislation to the floor for a vote. In the end, the bill failed 53-44. All Republican senators present voted to end the filibuster. They were joined by Democrats Joe Manchin of West Virginia, Bob Casey of Pennsylvania, and Doug Jones of Alabama. Three Republicans were not present to vote — Sens. Lisa Murkowski of Alaska, Tim Scott of South Carolina and Kevin Cramer of North Dakota. The six Democratic 2020 presidential hopefuls — Kamala Harris of California, Cory Booker of New Jersey, Elizabeth Warren of Massachusetts, Kirsten Gillibrand of New York, Amy Klobuchar of Minnesota and Bernie Sanders of Vermont — voted to block the anti-infanticide bill. Sasse singled them out for notice, reminding them that on the campaign trail they talk about supporting the vulnerable. “Was that all just claptrap for the campaign trail and for soundbites? Or do people mean the stuff that they say around here?” he said. Does this vote prove how far the left has gone? The defeat came after Senate Majority Leader Mitch McConnell urged Democratic senators to reject the fringe element of their party. “So my colleagues across the aisle need to decide where they’ll take their cues on these moral questions. On the one hand, there are a few extreme voices who decided some newborn lives are more disposable than others. On the other side is the entire rest of the country,” the Kentucky Republican said, according to The Washington Post. “It isn’t about new restrictions on abortion. It isn’t about changing the options available to women. It’s just about recognizing that a newborn baby is a newborn baby. Period,” he said according to The Hill. “Evidently the far left is no longer convinced that all babies are created equal,” he later remarked, according to Politico.